I have a sentimental lamp that stopped working. I changed the light bulb but the light still does not work. The lamp is about 50 years old and in bad condition. The light/electrical outlet circuit breaker is turned on. Please help me to troubleshoot my lamp as it has sentimental value. What parts of a lamp can fail and cause the light to not work? LAMP REPAIR – Lamp Stopped Working – How To Fix A Faulty Light? HOW TO FIX A LAMP THAT DOES NOT TURN ON: Be sure the lamp is plugged in, try a different power outlet, make sure the power outlet is on, try a different light bulb, check the circuit breaker, screw the bulb all the way in, wipe off the threads on the light bulb, turn the light switch to ON. Are the brass socket tabs at the bottom of the light socket positioned correctly? Bend with needle nose pliers if needed. Is the top of the lamp loose? Over time, spinning can make the wires disconnect. Inspect the wiring to be confirm it is secure/not loose. If your lamp does not illuminate, then a faulty bulb, a faulty power outlet, a faulty switch, a faulty light socket, a faulty plug, a faulty brass tab, or a faulty cord may be the issue. You will need to troubleshoot the issue to fix the lamp. 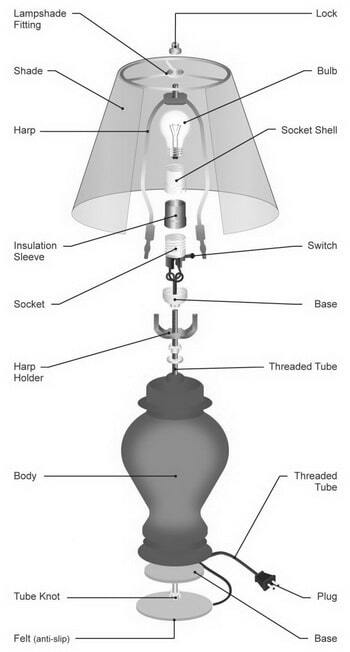 See below for a step-by-step guide to fix your lamp. First check that the light bulb is not burned out. Be sure the bulb is cooled down and remove it from the lamp. Gently shake the light bulb to see if it’s burned out. You will hear a small piece of the filament in the bulb moving around if the bulb is bad. Change the light bulb if it is burnt out. If the bulb is good and the breaker is on, check that the switch is working properly. The lamp will have a switch where the bulb screws into on the socket or on the power cord. Inspect the light switch and be sure it is functioning properly. You should hear a clicking noise when the switch is pressed or turned. If the switch is not functioning properly, unplug the lamp and take the switch apart. Replace the switch if necessary. The light socket may have debris in it and therefore the bulb cannot make a connection. Unplug the lamp, remove the light bulb and inspect inside the bulb socket. At the bottom of the light socket, check to see if the electrical bulb terminals are flat and not making contact with the bulb. Be sure lamp is unplugged and pull up on the terminals so the light bulb can make a connection. If damage is found you will have to replace the light socket. If all other parts of the lamp are in working order, check the lamp power cord. Unplug the cord and inspect for damage. If the cord is damaged, this can make it so the light does not receive power. The power cord may be old and brittle and needs to be replaced. Remove and replace the lamp power cord if damage is found. The electrical plug may have an issue. Inspect the electrical plug to be sure it is not damaged. If the plug is damaged it will need to be removed and replaced. Unplug the lamp from the power outlet. Check for continuity with a multimeter from the plug to the socket when it is switched on. Check the switch for continuity when it is switched on. You will find the part that has failed if this is an electrical issue. Light cannot be turned on? You may have a broken knob on the light switch. A lamp replacement knob is inexpensive and can be replaced easily. You will need a new knob. Remove the old knob by unscrewing it. Screw in the new knob and test the light to be sure it lights up. Need help with a lamp that does not illuminate? Please leave your question below with the problem you are having. We can get back with you and assist you with fixing your lamp or light. Next post: Refrigerator Has NO Power – How To Troubleshoot?